Below is a list of some of the locations that I have been visiting regularly for several years. You will find a brief description of each place and sightings that I have recorded in the area. This page is very much a work in progress and will be regularly updated. People visiting Darwin are greeted with the warmth of a tropical city with all the green vegetation, and vibrant multicultural environment. Darwin is very unique for an Australian capital city. There is water everywhere - rivers, creeks, streams, all feeding into the harbour or out to sea. And dressing all these waterways are the riverine and mangrove habitats, often blending out to savannah woodland. Our city planners have seen fit to allow vast reserves of such habitat to be unspoiled as they provide the perfect buffer zone, protecting the city and suburbs from flooding and tidal inundation. The result – wild places for birds, reptiles, small marsupials, even the occasional Estuarine Crocodile – right in the suburbs of Darwin. People travel from all over the world to see Darwin’s wildlife. I have compiled a list of endemic and near endemic species that you really need to come to Darwin to see. Birdwatching is an activity that many Ozzies don’t understand. I’ve been told that in the UK about half of the population are birdwatchers, and in America about one in five consider themselves to be birdwatchers. 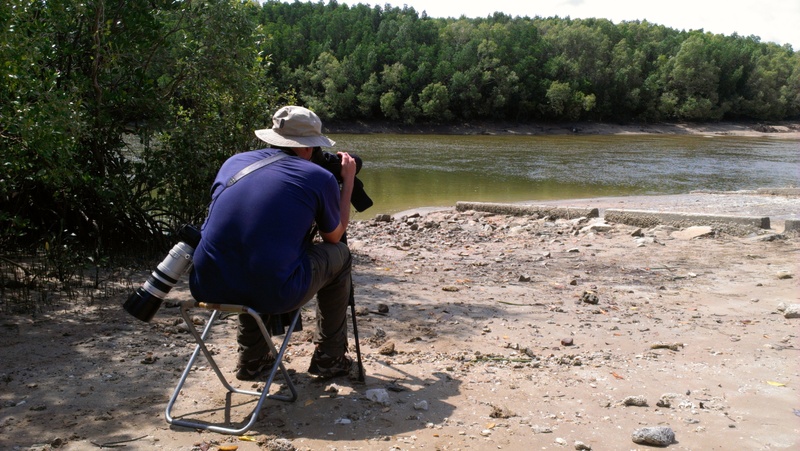 In 2006 US bird watchers spent over $36 billion on their hobby. So we get quite a lot of overseas visitors that know more about our birds than the average Ozzie. But we do get quite a few Australians coming out on our tours. Some wouldn’t really call themselves birdwatchers, more just nature enthusiasts, but after their outing with us they have a whole new world open up to them. On a morning birding trip we often see around 40-50 species and on a full day tour it’s more like 80. 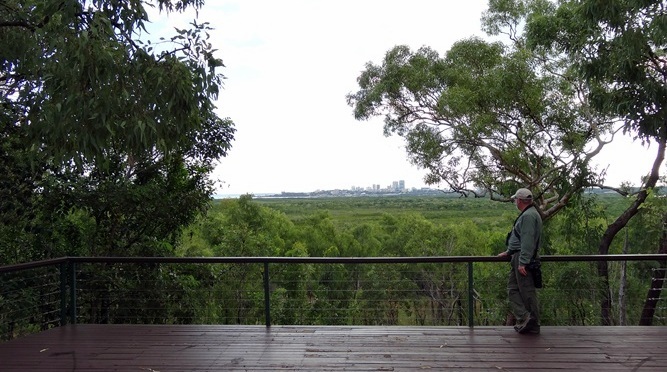 Author Jonathan Franzen, who visited Darwin recently, said that ‘birdwatching is a way of transforming an abstract concern for the environment into a personal connection with it’. It’s popularity is growing with Australians, particularly the ones that visit Darwin and the Top End. Links below are to excellent birding locations within the Darwin and Palmerston suburban areas. There are references to streets to help you find some of these places, so a Darwin street directory will come in handy. Outer Darwin area homes are often 5 and 10 acre properties run as hobby farms, landscaped for the owners enjoyment or even officially designated as 'Land for Wildlife'. Here are links to some good birding sites in outer Darwin. Mary River National Park is west of Kakadu and provides corridors and refuges for wildlife along the Mary River from Chambers Bay on the coast to Kakadu National Park. It is surrounded by pastoral land and Mt Bundy military training reserve. (1200m2). Below are links to good birding areas in and around Mary River National Park. In 2013 Kakadu was voted number one in the top ten bird watching destinations in Australia by Australian Geographic. About 280 species are seen in the park. There are three endemic bird species. Ramsar aims to stop the loss of wetlands and to conserve existing wetlands through good management, a total of 683,000 hectares of wetlands in Kakadu are listed as wetlands of importance. The three nations are Australia Indonesia and Papua New Guinea. The project aims to develop a co-operative arrangement between the three nations to share experiences in wetland conservation and promote good training and management programs. Wetlands in all three nations are significant stop-over points for migrating birds on the East Asian/Australasian Flyway. While most areas in the park are accessible with a two wheel drive vehicle, some areas are four wheel drive only. 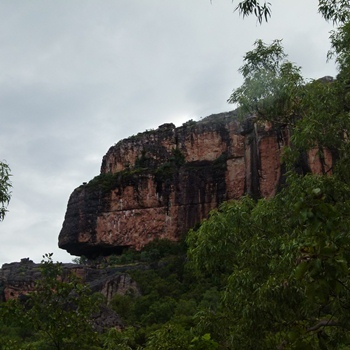 Please click here for the current Kakadu Road Report. The links below take you to some great birding locations within Kakadu National Park. Pine Creek is a lovely, quirky little historic town that was bigger than Darwin in the gold rush days! In the late 1800's the population was more than 3000 but now is less than 400. The locals are proud of the town's history and friendly to visiting birders. They will often offer information on their own personal sightings of Hooded Parrots which can often be seen at various locations around the town.